The concept of High and Low moves is fundamental to Go Strategy. With high we usually refer to the fourth line, while low refers to the third line. The proverb says: "High move (4th line) for influence, low move (3rd line) for territory"
According to traditionally accepted views, the corners and sides of the board earn the most territory. The center is generally thought to earn the least. On a 19 by 19 board, it is thought the third line is easiest to earn territory on. It builds a fair amount of it and cannot be invaded anymore. 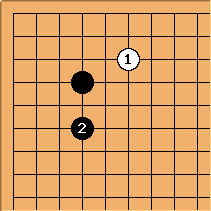 In this diagram, Black has about 12 points of territory along the left side. When Black plays here, he's has not built complete territory yet. His formation is still open to invasions. When we play along the fourth line, it mostly has a different purpose than making territory. 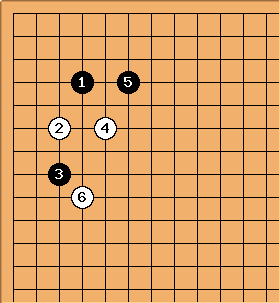 In this common joseki for example, White plays on the fourth line. is not a move which creates territory. faces the center and not the side. faces the side, so we expect to earn the territory along the side. 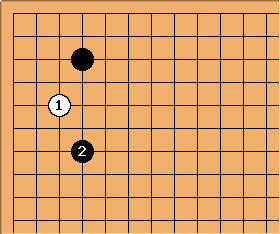 Black "walks" along the third line, as Kageyama would say, with White "walking" along the fourth. 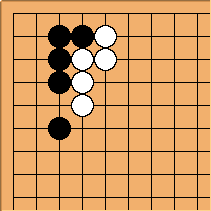 Black earns the side territory, and white gets influence in the center. 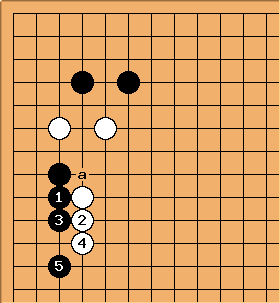 (the standard push at a by Black has been omitted for simplicity). Such central influence can be used to build a moyo, to be combined into overall thickness, to attack or to invade elsewhere and use these stones as support. is a low approach. is a high pincer. The issue of pincers is discussed at High vs Low Pincer.